Finding the motivation to be physically active is hard enough for folks who have all four limbs. For those with limb loss, it can be even more of a challenge. When it comes to rehabilitation and getting back on one’s feet – or foot, as the case may be – there are plenty of resources available for amputees. However, for amputees like me who aspire to peak athletic performance, rehab does not equal training. And frustratingly, the training information simply doesn’t exist. As such, over the last few years I’ve had to tread my own path in the weight room. With the help of mentors like Bret and Barry Fritz (my instructor at the National Personal Training Institute of Philadelphia), I’ve been able to come up with a catalog of lower body exercises for which I’m well suited. Since we above-knee amputees rely on our prosthetic side glutes (and hamstrings, if present) for torque production, all the exercises on the list target the posterior chain. May this post serve to shorten the learning curve for other aspiring amputee athletes, as well as anyone in search of posterior chain development. After all, who doesn’t want a better backside? Programming for the above-knee amputee athlete is a unique challenge. What are generally considered foundational lower body exercises like bilateral squats and deadlifts often prove contraindicated due to the amputee’s altered anatomy and proprioception. On the affected side, the amputee is missing all ankle and knee musculature, of course. He also usually lacks dorsiflexion range of motion on that side, so when he squats, his prosthetic heel lifts way up off the ground. As a consequence further up the chain, he likely goes into lumbar flexion well before reaching parallel. Depending on how high up his socket goes, he may also experience discomfort and lumbar flexion with deep hip hinging, thus ruling out deadlifting, as well. The simple solution is to ditch the prosthesis and train unilaterally. At first pass, this method seems like a winning one. The amputee performs exercises like single leg squats and single leg stiff leg deadlifts with ease. Heck, his intact leg is oftentimes stronger than many people’s two put together! The unilateral approach turns out to be shortsighted, however, as the amputee naturally over-relies on his intact limb in his day-to-day life. Training one side and not the other in the gym only exacerbates the pre-existing left-to-right trunk and hip asymmetries. This will almost inevitably lead to injury and pain – especially if training heavy. An exhaustive search must be conducted for movements that can be trained without dysfunction on both the prosthetic and intact sides. Since the above-knee amputee relies solely on the hip for torque production, all the exercises will target the posterior chain through hip abduction, extension, and external rotation. What follows is a catalog of lower body exercises presented in developmental sequence (i.e. “from the ground up”). 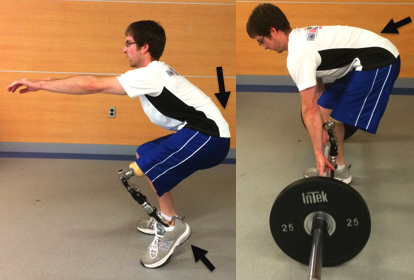 Although able-bodied folks typically have more options than amputees when it comes to exercise selection, they too can reap the many benefits of improved posterior chain development by emphasizing the exercises on this list. 1. Glute Bridging. The key for this and every exercise is the mind-muscle connection with the prosthetic side glute. Bridging is easy if the intact limb is allowed to dominate, but rather taxing when equal contributions are demanded from each limb. 2. Side-lying Abduction or Clamshell. Minimal external resistance need be applied, as the prosthesis itself will likely provide a substantial load. As with any unilateral exercise, resist the urge to do more reps with the intact side than the prosthetic side. Instead, go to the other extreme and perform an extra set on the weaker prosthetic side. 3. Front Plank with Posterior Pelvic Tilt. This is a great exercise for symmetry through the core, as the position lends itself to forceful and uniform contractions of the left and right abdominals and glutes. Fifteen to twenty seconds of maximal contractions will do the trick. 4. Bird Dog. To ensure the movement comes from the hip and not the low back, push back through the raised leg (as opposed to up). 5. Turkish Get-up. At first, perform the get-ups “naked” (without weight). Sets should be comprised of just a couple of slow, controlled reps on each side. Since the amputee won’t be able to stand from the half-kneeling position on the prosthetic side, simply reverse directions at half-kneeling on both sides in order to maintain symmetry. For the side where the prosthetic leg is straight out in the start position, a bit of extra finessing will be required in order to sweep the prosthesis through to half-kneeling. Pay careful attention in the accompanying video. 6. Dowel Rod Hip Hinge. With a dowel rod held behind the neck and in the small of the low back, push the hips straight backwards. The knees should be bent slightly, with weight distributed equally on each leg and through the heels. Take note of the depth reached comfortably and without lumbar compensation. 7. Back Extension. For a glute-dominant back extension, keep the anterior core engaged throughout the movement, push the hips into the pad violently on the concentric phase, and squeeze the glutes hard at lockout. Avoid hyperextending the lumbar spine at the top. Since the hip tends to work on a diagonal with the opposite shoulder, target the left hip preferentially by raising the right arm above the head to make half of a letter ‘Y’ (and vice versa for the right hip and left arm). 8. “B-stance” Reaching Stiff Leg Deadlift. Line up in a staggered stance a couple of feet from the wall. Shift most of the weight onto the front leg by going up on the ball of the back foot and flaring it out slightly. Push the hips straight back while simultaneously reaching for the wall. A slow tempo (2/0/2) is crucial for avoiding the use of momentum and maintaining tension on the hip extensors of the front leg. 9. Rack Pull. Set up inside the power rack with the supports adjusted to about knee height. (The exact setting will depend on hip hinge mobility.) Once again, utilize a 2/0/2 tempo. Experiment with both conventional and wider (sumo) stances. If the prosthetic knee locks when straightened, stop the pulls just short of lockout. Avoid the temptation to load the bar too heavily at first. It’s essential that the prosthetic and intact limbs split the load equally. 10. Stiff Leg Deadlift or Good Morning. As with the dowel rod hip hinge, maintain a subtle knee bend with equal weight through each heel. Begin light with just the bar, or even a 15-pound bar for good mornings. The added external load should not result in a deeper hip hinge than that attained during the dowel rod drill. If the prosthetic knee tends to get stuck straight, reverse directions just short of lockout. 11. Band/Cable Hip Rotation. Raise the cable pulley or band attachment to chest height, and take a couple of steps away from the anchor. With the feet angled away from the anchor, twist through the inside hip (via external rotation). Do not rotate through the trunk. Naturally, some individuals will be better suited for certain exercises than others. Only trial and error will reveal which exercises are best. After working through the entire list, return to the top, and focus on progressing those best-fit exercises with higher reps and increased loads. After a bit of training, exercises like bird dogs and reaching stiff leg deadlifts can be relegated to warm-up. Athletes should then narrow their focus to getting strong in just three or four lifts at a time (one per training session). My personal preferences for a “Big 4” are barbell glute bridges, back extensions, rack pulls, and good mornings. With proper training age, some amputee athletes may be inclined to delve deeper into explosive exercises like kettlebell swings and Olympic lifts (from the hang position). Prerequisites for these movements include great balance and a top-notch hip hinge. The primary concern, as always, should be on eliciting equal contributions from both limbs – an even greater challenge at increased contraction speeds, though certainly not impossible. Of course, for the amputee athlete, nothing is impossible. Travis Pollen is an NPTI certified personal trainer and American record-holding Paralympic swimmer. 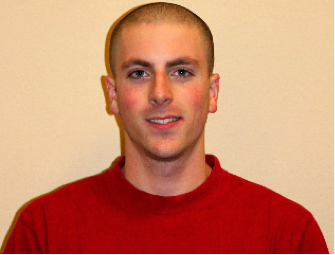 He is currently pursuing his Master’s degree in Biomechanics and Movement Science at the University of Delaware. He has been featured on T-Nation.com, Schwarzenegger.com, MensHealth.com, and MOVE-Everywhere.com. He also blogs and posts videos of his “feats of strength” on his website, www.FitnessPollenator.com. Be sure to like him on Facebook. The post Lower Body Training for the Amputee and Able-bodied Athlete Alike appeared first on Bret Contreras. The post The No Barbell Experiment on Squat and Deadlift and Hip Thrust Strength appeared first on Bret Contreras.